Description: Handcrafted from Solid Brass, this Craftsman Signature Pendant is inspired by the Arts and Crafts movement. The striking Mission straight line design is featured in a Frosted Seeded Glass Shade which is enhanced with a Verde finished frame and hardware. The overall height of this pendant ranges from 29-63 inches as the chain length can be easily adjusted in the field to accommodate a specific lighting application. 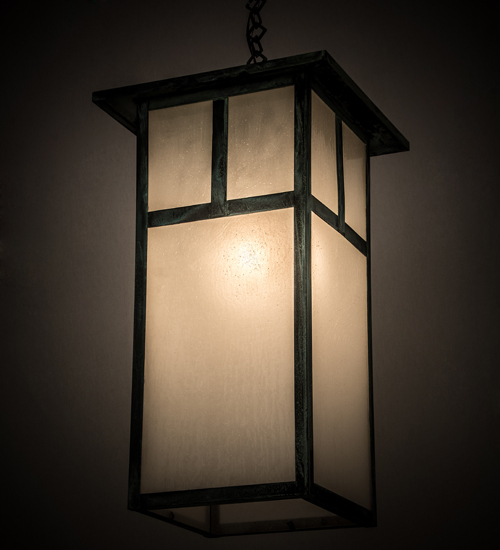 The fixture is perfect for illuminating lobbies, foyers, ballrooms and other large spaces. Handcrafted by highly skilled artisans in our 180,000 square foot manufacturing facility in Upstate NY. Custom sizes, styles, colors and lamping options are available. UL and cUL listed for dry and damp locations.